National Capital Region home of all the cities. National Capital Region is this the place of power? The National Capital Region in the Philippines is best or commonly known as Metro Manila and as far as its population goes, it is huge, with more than 11 million people in only 636 square kilometres. The National Capital Region is the main financial, commercial and educational centre of the Philippines and is the region where nearly all who travel here has to pass through. The National Capital Region not only contains the Philippines capital city Manila, but also thirteen other cities and three municipalities so it is no wonder that it is the most populous region in the Philippines. It is also the smallest region, for those of you who are interested. Where is the National Capital Region? The smallest region in the Philippines is found on the largest island of Luzon. It shares borders with only two other regions, Central Luzon Region or Region 3 and Calabarzon Region or Region 4a. The province of Bulacan in Central Luzon Region is to the north. 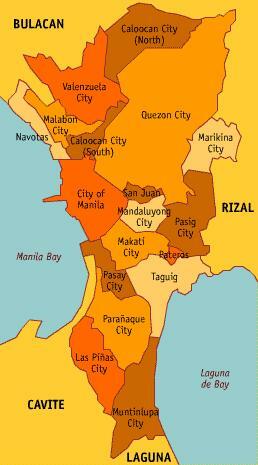 Sharing a border to the northeast is Rizal Province, which is part of Calabarzon Region. Also from Calabarzon Region are the provinces of Cavite and Laguna which are to the south of the National Capital Region. To the east and the west you have water, Laguna de Bay and Manila Bay respectively. Both these bays are joined by the Pasig River. Where are the Provinces in the National Capital Region? Unlike the other 16 Philippine Regions, the National Capital Region does not have any Provinces. The National Capital Region is actually divided into four districts. These districts are geographically placed around the Pasig River, which flows from Laguna de Bay and drains into the Manila Bay. It is a bit of a nasty river with a lot of industrial pollution and is actually deemed to be a dead river. There are plans in place to clean it up, but I guess time will tell...still waiting. Okay lets get back to the districts. The four districts, 1, 2, 3 & 4 have no powers or local government representation and are only used to obtain statistical information, enough said about the four districts, let’s move on to the cities. There are fourteen cities, which make up the National Capital Region or Metro Manila. The landmark of the father of the Philippine Revolution, Andres Bonifacio is here. Home to the Bamboo Organ built in 1824. The Philippines centre of finance and commerce with the odd mega shopping centre. Close to 340,000 people live here in under 16 square kilometres. Females rejoice! Home of one of the largest shopping centres in Asia – SM Megamall. The gateway to the Philippines, vibrant and alive. This where a lot of the rich and famous in the National Capital live. With seating for 2,000 people and capacity for another 9,000 to stand, it is no wonder the Baclaran Church is the most attended in Asia. Lots to see in Pasay City, both during the daylight and night time hours. Large commercial organizations are setting up shop here, the Ortigas Center is becoming the “in” place for businesses. This city is huge, both in land area and population. Nestled on the shores of Laguna de Bay, has a large residential population. For all you beer lovers, this is home to the San Miguel Brewery. Each of the above fourteen cities has there own mayor. The three municipalities also have a governing mayor. A coastal municipality or town that is well known for it’s fishing port. If you enjoy balut then you need to come here. Make sure you come here during the feat of St John the Baptist. You guessed it the feast involves lots of water, usually over everyone!